Thoroughly mix all dry ingredients together (a whisk works well for this). In a separate bowl, mix all wet ingredients. In a large bowl, combine both the wet and dry ingredients until just mixed. Don't over mix. Pour bead mix into a 9 X 5 X 3 inch loaf pan (paper, paper lined, non-stick or silicon pan). Bake for 45-47 minutes or until a toothpick inserted into the center comes out dry. To make muffins, use paper cupcake paper cups and muffin pans. Put one paper cupcake (muffin) cup in each of the muffin slots. Fill each cup 3/4 full. Bake at 350 for 25 minutes. A toothpick in the center should come out dry if they're done. Fall is here and root vegetables are at all the Farmer's Markets. This is fairly easy and delicious. You can use TVP Beef Chunks for that beefy texture and added protein or just keep it Veggie. In a heated non-stick stock pot saute the onions and mushrooms. When the onions have caramelized, add the carrots and celery and continue sauteing. Add the Tomato Paste. If the saute begins to stick, add a bit of the stock to release the pieces stuck to the pan. Add the leeks and garlic. Add the Tamari, Balsamic Vinegar, Miso Paste and Mushroom Base. Add the Rosemary and Herbs De Provence. Add the remaining vegetables and stock. If you are adding TVP chunks (textured vegetable "soy" protein), re-hydrate 1 cup first in 2 cups of stock or water that's been brought to a boil and 3 tablespoons of Tamari. Re-hydrate for at least 10 minutes or until soft and then chop into different size pieces. Add the "beef" and S&P to the pot and cover to simmer for about an hour. Taste for flavor and adjust if needed. After serving sprinkle with chopped carrot greens or parsley. Delicious served with a Crusty piece of my Perfectly Perfect Sourdough Bread. 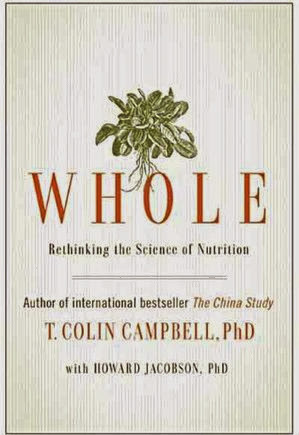 This is the latest book that supports the nutrition program I follow which is Whole Foods Plant Based. Very interesting read. Not a diet book, rather a book on why this is a healthy way to eat and gives you information to quiet the naysayers. 1 15 oz can pinto or black beans, rinsed. In a separate sauce pan, add all of the following ingredients and heat until lightly boiling. Mix all of the ingredients for the eggs in a non-stick saute pan and heat completely. Add the sauteed onions and continue cooking. In a separate bowl, mash half of the beans. Add the mashed beans and whole beans to the eggs. Add the red sauce and stir. Finally, add the tortilla chips and continue cooking until the chips have absorbed the sauce and softened. Serve with a dollop of sour cream and some chopped cilantro. I've already posted a version of this with seitan but, since seitan is not easily found, I created a different version using lentils. My very picky aunt even loved this. Caramelize the onions in a non stick skillet. Add the celery and mushrooms and saute until soft. Add the garlic and thyme and continue to saute for about two minutes. Add 2 cups of the Roasted Vegetable Stock and the granulated onion and garlic. Mix well and reduce for about 5 minutes. Add the tomato paste, ketchup, crushed red pepper, tamari. Mix well and add the TSP. The TSP will begin to hydrate and soak in a lot of the moisture. If it becomes too dry, add more stock. Continue to cook the mixture for about 10 minutes until it reduces and there's not much stock left. Add the lentils, and if it becomes too dry again, add more stock. You may have some stock left over at the end. Quarter the potatoes and add to a pot of cold water. Cook for about 25 minutes until they are fork tender. Drain and mash adding the almond milk, sour cream, salt and white pepper. In a baking dish add the vegetable lentil mixture. Smooth out the top and add the mashed potatoes. Loosely cover with aluminum foil and put in a preheated 350 degree ove for 45 minutes. Remove the aluminum and bake for another 15. If you want, you can briefly put the pie under a broiler to get a little browning going on the top. Costco has a new product that gets lots of green veggies without the usual work. In other words, it's cut, washed and dried (and I don't mean hair) Have a look. I used a 15 oz can of black beans. To that I added a teaspoon each of granulated garlic, granulated onion and cumin, 1/2 teaspoon cayenne pepper and 1/2 teaspoon salt and 1/4 teaspoon pepper. Pour the canned black beans into a non stick skillet. Add the dry spices and stir. Add about 3 cups or the Power blend greens and 1/4 cup water. Cover and stir occasionally. Serve over a bowl of brown rice.